On a recent trip to the Van Gogh Museum in Amsterdam, my son and I stumbled across an app entitled, “Touch Van Gogh.” It was an easy to use tablet application that demonstrates the impact time and light on Van Gogh’s most famous paintings. Iconic images we see in our mind’s eye are many shades from their parental color DNA at the time of inception. Blues were purples, yellows were heavier, stars shown differently, and even the brown of the floor had richer hues. 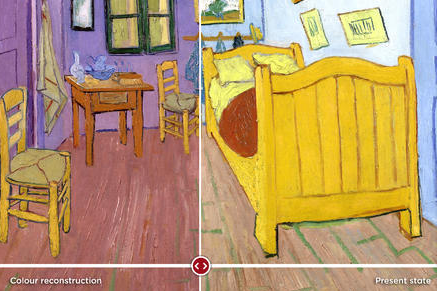 Sliding the bar across the images, the before and after transformation of aging on each painting was remarkable. The experience was such a vivid and palpable reminder of the power of demonstration. The app oriented us to the images that were directly in front of us and provided a paradigm shift. No words or explanations were needed. The results were evident and I was hooked on the story and the impact of the museum’s curating and restoration consideration. The power of a hands-on experience manifested itself by letting me join the narrative..